When Bal Thackeray passed away this month, the reaction among India’s elites was noteworthy. I followed the ‘twitterati’ closely. Bollywood actors such as Arjun Rampal and Akshay Kumar RIP-ed for “Balasaheb”. Hrithik Roshan had a “silent prayer in my heart” for him and Ritesh Deshmukh lauded him as a “hero”. While for R Madhavan Thackeray was a “mighty Tiger”, Dilip Kumar disagreed - he was even more majestic: “not a tiger, but a Lion”. Anupam Kher described him as a “courageous and true nationalist”. Praise for Thackeray’s undying nationalism also came from one of India's top ‘marketing and management gurus’ Sohel Seth, who tweeted that ‘...you could never doubt either his nationalism or his zest for life!’. Some made it a point to mention his closeness to them or at least mention that they had once upon a time shared a room with him. "Yes, Bala Saheb, I would like to believe, was close to me, and never had I imagined that I would live to see his motionless body!! ", wrote Amitabh Bachchan, while media personality/journalist Rajdeep Sardesai nostalgically tweeted about an interview with him in his days as a "cub reporter" during which Thackeray had been "generous with his time and thoughts" and "offered me beer too!". Rajnikanth felt the loss of a “great leader” and “father figure” while Lata Mangeshkar felt similarly “orphaned”, stating “Woh thhe toh Maharashtra thha...woh nahi toh kuch nahi”. Others who also felt this void included filmmaker Mahesh Bhatt and Rajdeep Sardesai who tweeted that ‘Maharashtra politics without Balasaheb [is a] bit like cinema without a Big B. Will not be the same’. News anchor Sagarika Ghosh described him as “a cult figure” who transformed Maharashtra politics and even Sachin Tendulkar felt the “terrible loss” of someone who made such an “immense contribution” to Maharashtra. ‘He will always be remembered and missed’, said our famed cricketer. This is the crème de la crème of Indian society – the most famous movie stars, politicians, cricketers and media personalities - expressing grief over the death of a man who embodies a vision of India which is deeply antithetical to the one enshrined in our constitution. These elites - political, economic, cultural, and intellectual - seem to think that nationalism is always and necessarily a good thing. Apparently, the more zealous the nationalist, the most worthy he or she becomes of respect. Even if this nationalism is not the secular, inclusive nationalism that Gandhi and Nehru stood for, but instead draws from the exclusivist, ethno-religious nationalism that was envisioned by V.D. Savarkar and Gandhi’s assassin, Nathuram Godse. These persons extol Thackeray’s ‘uncompromising’ nationalism even if this means humiliation, second-class citizenship, or even elimination of those sections of society which excludes from his definition of ‘nation’. They will apparently laud any individual who ‘transforms’ politics even if his ‘contribution’ has been to introduce a politics of ethnic and religious chauvinism, based on aggression. This was Bal Thackeray’s contribution to Maharashrian politics - a politics of hate, terror and violence against an “enemy Other” who was either non-Maharashtrian or non-Hindu. While his targets kept changing with each decade – from Gujaratis and “Madrasis” in the 1960s, Communists in the 70s, Dalits and Muslims in the 80s and 90s, to Biharis in the new millennium – the existence of some or the other imagined ‘enemy’ was crucial for Thackeray’s politics to thrive, for without them how could the Mighty Tiger roar? Have those who praise his contribution to politics forgotten that his “roars” were often accompanied by terror and violence? In the 1960s, his Shiv Sainiks threatened Gujarati-owned shops and businesses and beat up Tamilian shoe-shine boys. In the 70s, they stabbed and killed a CPI (Communist Party of India) legislator, and were associated with riots in Bhiwandi and Jalgaon in which around 82 people were killed. The 1980s saw the Sena cadre attacking landless Dalits in Aurangabad district. In 1984, a statement on the Prophet by Bal Thackeray provoked riots in Mumbai, Thane and Bhiwandi which claimed 256 lives. Thackeray was indicted by the Srikrishna Commission Report for directing violence against Muslims in the post-Babri Masjid riots of 1992-93.So proud was Thackeray about his role in those massacres that when Mani Ratnam’s Bombay was released, he was incensed that his character was shown to have expressed regret. “Why should I regret?” he asked rhetorically. What is one to make of Anna Hazare’s expression of grief at the death of this “warrior” - of the sheer hypocrisy of a man who considers himself to be Gandhian expressing sadness over the death of a demagogue who thought nothing of non-violence, evidently made no distinction between “means” and “ends” and once declared that “It is a Hitler that is needed in India today”. The educated elite of India apparently do not see this contradiction and hypocrisy, because they too cry simultaneously for Gandhi and Bal Thackeray. Despite their education, these elites are unable to discriminate between the different ideals and visions embodied by these two men, and instead view them as part of the same continuum. What is deeply worrying is the complete lack of attachment these educated people have towards the Indian constitution. Thackeray is not judged by how, as a political actor, he followed or deviated from the constitutional values of democracy, equality, freedom and secularism, but some other yardstick – a rigid, inflexible ideology, an ability to rouse passions and prejudices of people (his ‘gift for oration’ as Lata Mangeshkar put it) and to get what you want even if by threat and force. Equally disturbing is that the compromise that India has struck with ideologies of communalism, Hindu nationalism and ethnic exclusivism (and with violence that accompanies them) is not just at the level of politics, but has occurred at a deeper, societal level. 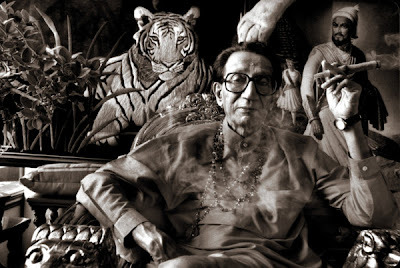 The tacit acceptance by educated upper and middle classes of such ideologies and methods is evident by the fact that Thackeray’s power and Godfather-like image inspires not shame and disgust but nostalgia and awe. Well written! Educated is not necessarily synonymous with free thinking and pragmatic. We live in a democracy and every person has a right to an opinion. Its just unfortunate that people look up to these individuals who view a fascist leader who helped a few while murdering many as a messiah. I am pretty sure all those elite intellectuals and the rest of the celebrities who praised him on Twitter did so out of some implicit obligation by being related to Mumbai either geographically or on some other level. It would not come as a surprise if many of them actually disliked him.